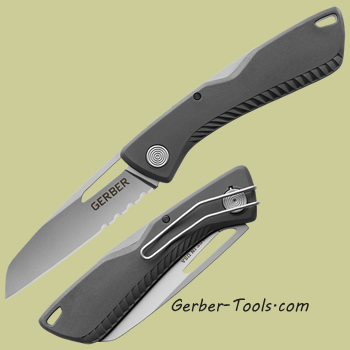 The Gerber Sharkbelly model 30-001410 is the serrated version of the USA made American knife. The steel type on the blade is 420HC. A traditional lockback mechanism holds the blade tight when it is steady. In fact when the knife is opened the lockback pop sound is very satisfying and reassuring as it locks the blade up. A changeable wire clip is mounted on the knife to give you the ability to tote the Gerber Sharkbelly in a tip down, left or right pocket carry. The Gerber Sharkbelly is an affordable Made in USA knife.